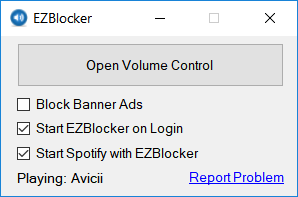 EZBlocker is a simple-to-use ad blocker/muter for Spotify. EZBlocker will attempt to block ads on Spotify from loading. If an ad does load, EZBlocker will mute Spotify until the ad is over. There are no fancy features, just pure ad blocking. When an ad is blocked, only Spotify is muted, so no other sounds will be affected. EZBlocker aims to be the most stable and reliable ad blocker for Spotify. There's no setup required - just drag it into any folder and run. To upgrade your EZBlocker, simply replace the executable file. EZBlocker requires Windows 8/10 or Windows 7 with .NET Framework 4.5+. Why is my Spotify is permanently muted? There may be issues with EZBlocker muting Spotify on your computer. You can manually modify your Spotify's volume by opening the Volume Mixer. How do I block banner ads? Check the "Block Banner Ads" box to enable banner blocking. Enabling and disabling this feature requires you to run EZBlocker with administrator privileges. Does EZBlocker block video commercials? EZBlocker will mute videos but not prevent them from playing. If you don't want video ads, make sure you keep your Spotify minimized. Why does my anti-virus say EZBlocker is a virus? The latest version of EZBlocker may be picked up by a few anti virus programs. This is most likely due to the way EZBlocker disables Spotify's ads. If you do not feel comfortable downloading the executables directly, feel free to view the source code and compile it yourself. I don't accept donations for EZBlocker. I would rather you spend your money on Spotify Premium. If Spotify Premium isn't offered in your region, I suggest donating to a non-profit such as the Tor Project. Yes it is, and I encourage all to contribute. The source & technical description is available on Github. If you run into any issues, comment below in detail the issue you're having. Great app. It got messed up a little when I upgraded to windows 8.1; now I can’t edit the blacklist. I’ll figure it out, though, and it still does a great job auto-blocking. This software make a bug when is open and you play a video . The video pause, resume, pause, resume. Hoever it’s great. Thanks man! Wouldn’t mind a whitelist option for those times when it thinks certain artists are always advertisements (and keeps putting them on the block list). An option to disable the balloon popup from appearing during every song would be great.